Sometimes it can be more convenient to have a Wireless Alarm Autodialler instead of a wired one connected to the PSTN networks. Our Wireless Autodialler uses the GSM mobile networks in order to send and receive alarm messages. Where there is high risk that a land line might fail either because of nature or due to malicious damage. This module allows you to have the best of both worlds, you can either just use the GSM wireless networks to send real speech voice alarm messages or switch to them if the land line fails or is cut. 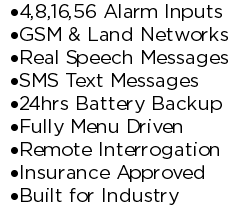 This module allows you send SMS text messages alerting your on call personal there is a problem on site. When opting for a wireless system instead of a wired system you do need to be aware they are not typically as reliable as a landline PSTN system. The GSM networks do not have the same operating capacity as PSTN phone networks. That is why at peak times e.g. New Year you cannot get a call out. Governments also have the right to shut down the GSM networks in times of national emergency or when they are performing sensitive operations. The GSM networks are also more susceptible to being disrupted by local electrical interference. Having an Alarm Auto dialler attached to your Fire Alarm today should be considered essential not only your peace of mind but a lot of insurance companies now require it. A fire alarm without an autodialler is a bit like the proverbial tree in the woods, if you have spend thousands of pounds getting the latest fire alarm installed with smoke and heat detectors dotted around and it is triggered at 0200 in the morning and no one hears it then it was a waste of money when you arrive in the morning and find the buildings no longer there. Even if you have a 24hr manned site with a security office you want them dealing with the fire not trying to find the emergency contact list. Most types of Autodialler supplied today are not up to the task, they are designed as cheap add-ons for residential intruder systems where if they fail and don’t dial out it’s not the end of the world. But if there’s a fire and people’s lives or you business are at stake then you need a reliable peace of equipment that is designed for the job. Channel to Roster – With this feature installed each channel is in practice a separate machine, which will dial a totally separate set of alarm numbers. So for example if channel 1 was activated it would phone telephone list 1, if channel 2 was activated is would phone telephone list 2 etc. This is ideal for a block of businesses where you want to communicate the detection of an alarm to the building owners and the individual businesses with out disturbing everyone else or buying multiple Autodialers. The M30 and its predecessors have been used around the world for the protection of property, assets, people and livestock since 1956. 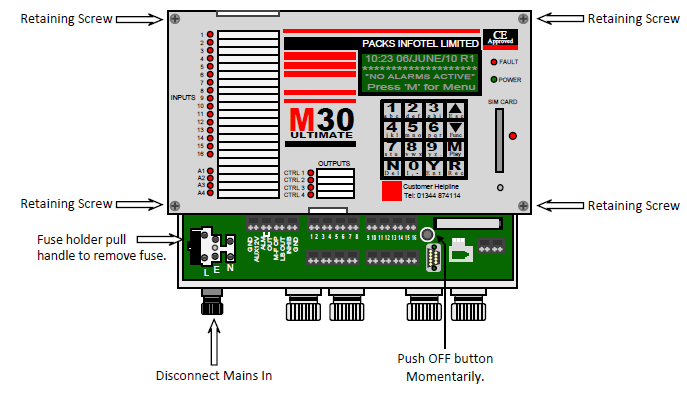 For more information how the M30 can connect to your fire alarm and the current Pricing please Contact Us or visit the Autodialler Standard Features or Autodialler Optional Features Page. GSM Alarm Diallers are fairly new to the market (i.e. the last 8 years or so) but in that time have shown themselves to be very useful and convenient either as an alternative to a standard Alarm Dialler or as a backup device. In situations where it is not practically or financially viable to get a land line installed or where there is a high chance someone might try to block the line a GSM Dialler can be ideal. A GSM Alarm Dialler is essentially the same as Landline Version but accepts a sim card and uses the GSM networks to make and receive alarm calls rather than PSTN land lines. Not all GSM Diallers are equal most are very cheap and are not designed to cope with commercial or industrial use, nor will they have the features a business might require i.e. multiple dial out lists for different staff rotas. For example the Commercial M30 Autodialler by Packs Infotel can use both Landlines and the GSM network, i.e. The M30 can use the GSM networks all the time or the M30 can use the Land Line networks and only switch to the GSM / Mobile networks if the land line fails. But you do need to be bare in mind that GSM / Mobile networks are typically less reliable than a fixed land line, as they are more susceptible to weather and local conditions and have a smaller network capacity. E.g. during peak times the mobile networks often become clogged and fall over. Governments also have the power to turn off or disrupt the GSM and or Mobile networks in an emergency. Because of this if you application is critical we would recommend where ever possible to use a land line as the primary medium and use the GSM networks as a backup. The very first question you should ask yourself is whether to choose a Domestic Auto Dialler System or an Industrial Auto Dialler System. The reason you need to ask yourself this is Industrial and Domestic systems are designed for totally different situations / environments and have specific functions & features that each may require. For example; Domestic systems don’t have integrated battery backup or mains failure detection, so if you purchased a domestic auto dialler then realised you wanted battery backup, you would have to slave the power from another panel reducing its standby time or get a separate item and then hobble them together. But Industrial versions have integrated battery backups that are designed specifically to work with that system, to offer maximum performance and reliability. But the most crucial question you need to ask is; is the Auto dialler going to be looking after a critical system or environment? E.g. Livestock, Hospitals, Fire Alarms, Lone Worker systems, Fridges / freezers, Horticulture, Data Centres – Basically anything where a human or animals life is at risk or your business would take a large financial hit if something happened. Because Domestic Auto Diallers generally speaking are mass produced items using the cheapest components possible, designed to operate in safe, room temperature dry environments. They are non repairable and non serviceable so engineers cannot check for early failure signs, when they do fail you just throw them away and replace them. Industrial Auto diallers on the other hand have integrated fail safes and backups so they will continue to function even after a failure occurs. They are designed to operate in harsh environments, so their internal components are designed to cope with high & low temperatures and power glitches. Typically they have high IP rated housings to keep moisture and vermin out as well. Industrial systems tend to have long operating lives, for example we have systems installed in the early 1980’s that are still going strong. They are also designed to be fully serviceable and easily repairable as required by most insurance companies. For more information on our M30 Auto dialler system check its Standard Features.